To our minds, a banana looks yellow during a sunny picnic. We are also able to identify it as yellow by candlelight, and under fluorescent lights. In each of those situations, the light illuminating the banana differs considerably. Even though a banana produces different compositions of wavelengths in different circumstances, our minds seek to determine the essence of the banana. Our yellow sensation tells us that bananas reflect a lot of yellow, even though depending on the light source, more orange or green might actually reach our eyes. This phenomenon of color constancy is complex, yet central to life, appearing even in creatures as simple as goldfish. The amount of light of any given wavelength reflected from a surface constantly changes, depending upon the type of light, or illuminant, in which it is viewed. We perceive the color of a surface to be the same, even though there are changes in shade. The world would be a confusing place if the color of a surface changed with every change in the wavelength composition of the light reflected from it. We would be unable to categorize color-related properties in the same way, and color would cease to be an efficient biological signaling mechanism. The brain is able to discount the effect of the continual change in the wavelength composition of the light reflected from a surface. This stability in color as we perceive it allows the brain to obtain knowledge about the properties of surfaces, despite continual variations in what reaches the eye from those surfaces. The notion that it is the brain that perceives color was well stated by the combative Arthur Schopenhauer in a book, On vision and colors: an essay (1854). The importance of this work is not so much in the details of the color theory that Schopenhauer produced (he proposed that color perception took place in the retina). Rather, it is in the supposition that colors lie within the observer, and not outside him or her. To Schopenhauer, color may be an immediate percept, and therefore intuitive, but "All intuitive perception (Anschauung) is intellectual, for without the understanding (Verstand) we could never achieve intuitive perception," implying a formal contribution of the brain to perception. In the second volume of his Die Welt als Wille und Vorstellung, Schopenhauer wrote that "perception is not only the source of all knowledge, but is itself knowledge... it alone is the unconditionally true genuine knowledge." We can interpret his use of the word Verstand to mean the operation undertaken by the brain and leading to the intuitive perception (Anschauung), since Schopenhauer tells us "the forms underlying Verstand, the Verstand is a function of the brain." The ability of the brain to assign a constant color to a surface or a constant form to an object is referred to as color or object constancy. We may categorize an object according to color, for example to judge the state of ripeness of an edible fruit. Yet, there are other ways in which the brain extracts only those permanent, essential, or characteristic properties of objects and surfaces that allow it to categorize them. Perceptual constancy is a much broader phenomenon. For example, it applies to faces, which we are able to recognize when viewing them from different angles, and regardless of their expression. A face may be categorized as a sad one, giving the brain knowledge about a person, despite the continual changes in individual features or in viewing angle, or in the identity of the face viewed. In a similar way, we may have to decide the destination of an object by its direction of motion, regardless of its speed or distance. There is also what can be called situational constancy, where the brain is able to categorize an event or a situation as, for example, a festive or a sad one, regardless of the particular situation. Narrative constancy refers to our ability to recognize common elements in the telling or portraying of a story. 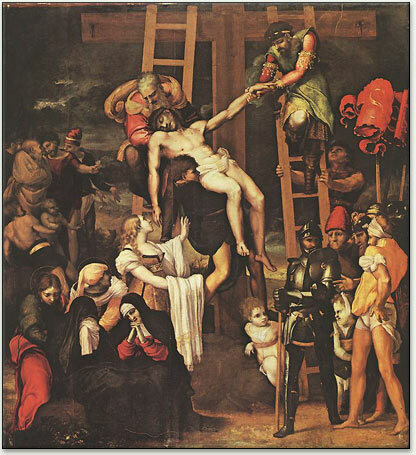 For example, the brain is able to identify a scene as the Descent from the Cross, regardless of variations in detail or the style of the painting. 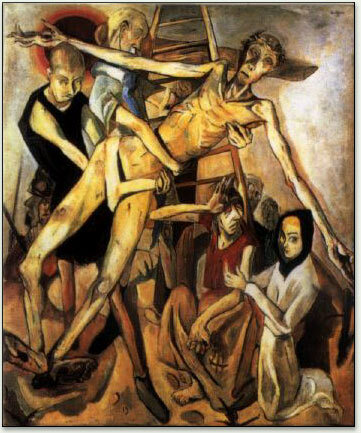 Descent from the Cross, painted by Pedro Machuca, 1547 (left), Rembrandt van Rijn, 1634 (middle), and Max Beckmann, 1917 (right). 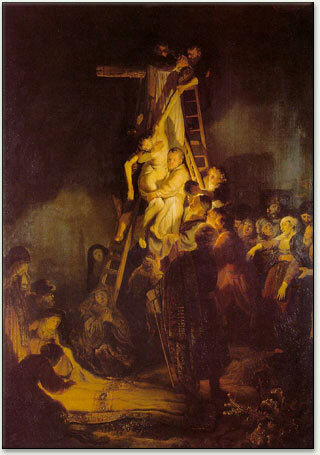 The painting, Descent from the Cross, in which Christ is taken down from the Cross for burial, is a general scene of mourning. 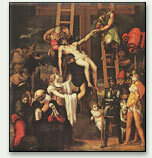 Traditionally present are Joseph of Arimathea, the rich Sanhedrin member who gave up his tomb for Christ, Nicodemus (carrying myrrh, and pincers to pull out the nails), the Virgin, usually overcome with emotion, Mary Magdalene (recognizable with her long hair, sometimes kissing Christ’s feet) and St John. Artists have gradually extended the scene, but it is always recognizable. The brain, in each case, extracts from the continually changing information received only what it needs to identify the characteristic properties of what it views; it has to extract constant features in order to be able to obtain knowledge about them and to categorize them. Our vision is an active process, depending as much on the operations of the brain as on the external, physical, environment. The brain must ignore much of the information reaching it, select from that information only what is necessary for it to be able to obtain knowledge about the visual world, and compare the selected information with its stored record of all that it has seen.